Gastrointestinal perforations of the upper gastrointestinal tract are extremely rare. 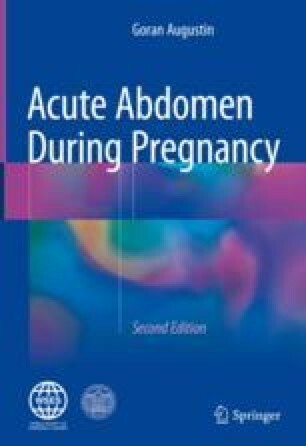 Peptic ulcer symptoms decrease during pregnancy due to healthier maternal habits during pregnancy in addition to pregnancy-induced hormonal gastroprotection. On the contrary perforations of the lower intestinal tract are more common due to spontaneous, disease-induced, and postinterventional perforations. Aside of intestinal endometriosis-induced perforations, the most common are postinstrumental perforations for termination of pregnancy. This is seen in a form of transuterine bowel perforation and is more common in undeveloped and developing countries where illegal abortion is relatively frequent. It is a complex injury necessitating simultaneous obstetric and surgical management. Extension of bowel injury determines maternal outcome and quality of life.